A NATIONAL HERITAGE SITE, this 1000-hectare farm has to be seen to be appreciated. 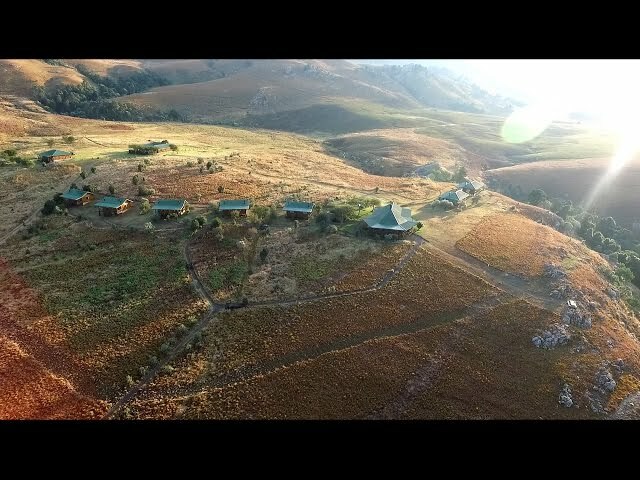 This mountain Lodge is at an elevation of 1800 meters above sea level and lies in the shadow of the greater Drakensberg peaks on the property – the ideal mountain getaway, lush green in summer and often snow covered in winter. The cliffs above us, are home to a colony of Cape Vultures, the foothills home to Eland and many other animal and bird species as well as lush indigenous forests and hidden San Rock Art. Dramatic waterfalls, deep valleys, and high peaks provide the ideal terrain for hiking, climbing, exploring, mountain biking, horse riding, or simply taking in the views. A large well stocked dam keeps those fly-fishermen occupied. Guided horse trails are available on request. A refreshing swimming pool provides for relaxation. We look forward to ensuring that your mountain experience is most enjoyable. The Greenfire Lodge Drakensberg is one of the jewels in the Lodge Collection. The Lodge features a main communal lounge, dining area, and cosy bar for socializing, overlooking the Royal Natal National Park and famous Amphitheater. Accommodation is in Canadian styled log cabins, each en-suite. Twin rooms all have their own fireplace. A communal lounge, dining area, and surround veranda with cosy bar for socializing, overlook the Royal Natal National Park and breathtaking Amphitheater. All meals are provided at this Lodge.